Do you want your lawn to look its best? 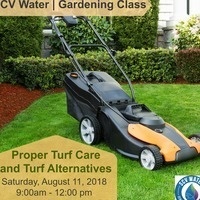 Come learn about techniques to maintain your turf that will keep it thriving and may improve water efficiency! Or, if you’re looking for some ideas for turf substitutes, we’ve got that covered too, with plants that work well instead of turf in your landscape.